I've tried hard, I really have... but I couldn't get my favourite books of last year (see previous post) down to ten. So here we have my top fifteen, not in any particular order. 1. The Book Thief - Marcus Zusak. 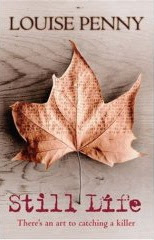 Young adult, set in Germany during WWll, and is about how a young girl survives during the war. Narrated by Death. 2. The Earthsea Quartet - Ursula K. Le Guin. Young adult fantasy. The travels, trials, and tribulations of the wizard, Ged. 3. Saplings - Noel Streatfeild. Persephone novel. Charts the disintegration of a family during WWll. Focusses on the children. 5. Family Roundabout - Richmal Crompton. Another Persephone novel. Concerns the dynamics and the interactions of two families, the Fowlers and the Willoughbys, during the 1920s. 7. Mistress of the Art of Death - Ariana Franklin. Historical crime. 12th. century Oxford. Adelia, a female doctor from Italy, has been sent to solve the murders of several children. 8. 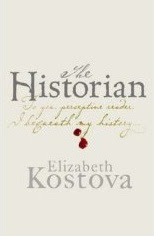 The Historian - Elizabeth Kostova. Horror. Vampires, but also a nice jaunt around Eastern Europe. 9. 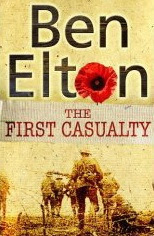 The First Casualty - Ben Elton. Historical Crime. WWl whodunnit but also much about conditions at the front. Not Elton's usual. 10. 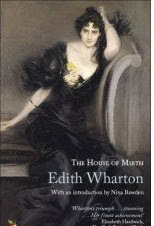 The House of Mirth - Edith Wharton. Classic Lit. New York around 1900. Charts the fall of Lily Bart, born to a life of ease and luxury but suddenly without the means to support such a lifestyle. 11. 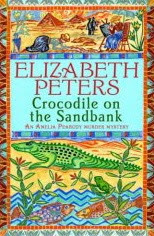 Crocodile on the Sandbank - Elizabeth Peters. Historical crime. First in the Amelia Peabody series of books set in Eygpt. 12. The Beekeeper's Apprentice - Laurie R. King. Historical crime. First in the Mary Russell series, charting the beginnings of Mary's relationship with Mr. Sherlock Holmes. 13. Still Life - Louise Penny. Crime. The first of the Armand Gamache series set in the village of Three Pines, Quebec. Wonderfully atmospheric. 14. The Adventures of Sherlock Holmes - Sir Arthur Conan Doyle. Historical crime. What can I say? Fiction - 59, non-fiction - 11. That's not so great. I thought I read more non-fiction than that. Female authors - 33, male - 37. Funny how you deceive yourself. I would have sworn I read and liked female authors much more than male. Re-reads - 4. Yeah, well... I knew I didn't reread much. I clearly have a taste for Young Adult fantasy - 17, plus a couple more I wasn't sure of. I've also clearly discovered a real liking for historical crime books! All in all I count the year a success. I've read more than ever, blogged more than ever, and made some delightful new reading friends. I can't wait to see what 2008 brings. Copying an idea from several people, this is just a list of my books read for 2007 so that I can link to it in my sidebar. I shall pick it to pieces ;-) and choose some favourites this afternoon. It's rather strange to be coming to the end of yet another reading year. It hardly seems five minutes since it started! Hopefully I'll squeeze in one, possibly even two, more books before the new year starts but, whatever, it's nice to finish the year on a high with some really fun reading. I feel like I want to really gush about this book. Several people, including deslily, recommended Laurie R. King's 'Mary Russell' series and being a bit of a Sherlock Holmes fan I had a feeling I would probably like them. Like? Make that 'love'! I adored this first one, The Beekeeper's Apprentice. Mary Russell is fifteen and lives in Sussex with her despicable aunt. One day while out walking she stumbles across (literally) a retired Sherlock Holmes watching bees. Recognising another with a similar mind to his own the two strike up a friendship and Mary eventually becomes a kind of apprentice in the crime solving business. It's while Mary is at university that a diplomat's daughter is kidnapped. Holmes and Russell work together on the case and bring it to a conclusion. But have they? And who is trying to kill them, and why? It was sort of weird at first to be reading a Sherlock Holmes book that was a)by an author other than Conan Doyle and b)not narrated by Watson! It's not quite the same, but then you wouldn't expect it to be and I personally was quite happy with the change in style, though perhaps not every dedicated Holmes fan would be. Depends on your preference really. I liked the portrayal of Holmes and found his friendship with Mary quite believable. It was nice in fact to see him as a human being with feelings and emotions and the ability to become attached to someone. I already know how the relationship changes and can't wait to read about how it happens. The crime element of the novel was also excellent; I tried to guess who was behind it all and got it quite wrong. The author does a great job of building to a climax and you fair gallop along with her to the end. Honestly, I can't recommend this book highly enough and am so pleased that there are many more in the series to read. Book two, A Monstrous Regiment of Women, is already on my tbr pile and will be one of my first reads for 2008. It's pouring with rain here tonight but I can still hear the church bells in the town ringing in Christmas. (It's 11.45pm.) They go wonderfully with the sound of raindrops falling on the roof. "A friend of mine tells me of the time she went to her small son's nativity play, at the local school one afternoon in the week leading up to Christmas. There had been much in the way of preparation. Costumes had been cobbled together, all the angels had been found wings and the customary dolly had been wrapped in swaddling clothes. Emotions were running high. When the great day arrived, the parents sat down in the audience to watch the performance. All went well until Mary and Joseph arrived at the inn and Joseph knocked on the door. It was opened by the innkeeper. 'May we come in?' asked Joseph. 'No!' replied the innkeeper abruptly and closed the door in their faces. The innkeeper shook his head vigorously. 'No, you can't!'. The door was slammed again. 'Because I wanted to play Joseph!'" Several people commented about my brother who I mentioned in my previous post. The news is that he will have to have an operation to replace his faulty heart valve. We hoped it wouldn't be necessary, he's disabled as it is and even being in hospital is difficult for him, let alone having to go through a major operation. But there you go, it *is* necessary and his quality of life will be much improved once the op is done. Thanks to all for your kind thoughts. I'll be back after Boxing Day no doubt. I may even have finished The Beekeeper's Apprentice by then! It's an excellent read, great fun, but my time for reading has been severely limited this past week so my Christmas ghost story anthology, borrowed from the library, has had to wait. Have a great day tomorrow and let's offer up a few prayers for more peace in the world. We could certainly do with it. I haven't posted all week, partly because I've been so busy with Christmas preparations, but also it's been a difficult week here. My brother was admitted to hospital with complications due to a faulty heart valve. It was rather unexpected so chaos kind of ensued. Sadly for him it looks like he'll be in hospital for Christmas but hopefully he'll be fine and 2008 will be a better year, healthwise, for him. 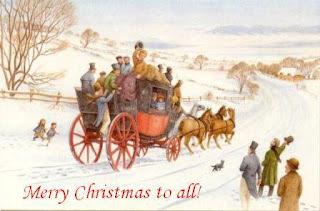 I just wanted to wish all the lovely people who drop by my blog a truly wonderful Christmas and I hope your holidays are all that you would wish for. Finished this one at last! It's been absolutely brilliant reading this in a relaxed manner over the past few weeks, especially as I seem to be in a Sherlock Holmes sort of mood. ITV3 have been showing various of the Jeremy Brett series for weeks so it's been a nice tie-in with reading the stories. Just a few days after reading The Speckled Band, for instance, they showed that one, so it was interesting to compare the two. (I thought it was very faithful to the original.) And I shall be able to do much more of this as one of my Christmas presents from my husband this year will be the complete boxed set of the same series. Of course some stories in the book were more familiar than others. A few, such as The Engineer's Thumb (my favourite I think), The Copper Beeches and The Beryl Coronet were almost unknown to me and thus I probably enjoyed them more than the more familiar like The Red Headed League or The Man with the Twisted Lip (though I do love that one too). I now seem to have reached the exalted heights of Commodore with my Seafaring challenge. 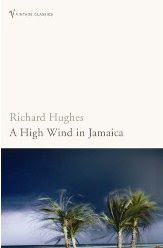 Three books read, one of them a classic, and that classic is A High Wind in Jamaica by Richard Hughes. Well, this wasn't precisely what I was expecting. My overall memory of this is of the film of the book which was frequent Sunday afternoon TV viewing when I was a child. It seemed a happy film of children mistakenly taken off by pirates, the captain of said pirates being played by Anthony Quinn. So, it was kind of surprising to find this book is quite different to that. The plot concerns the Bas-Thornton family who live in Jamaica. The five children of this family run wild in the ruins of the sugar plantations until one day they experience a hurricane. 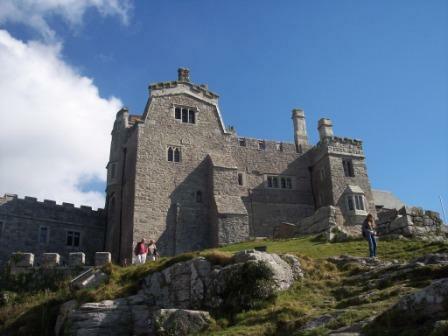 The parents decide it's too dangerous for the children to live there any more and pack them off to England. The ship they're on is boarded by pirates somewhere off Cuba and the children mistakenly get carried away. What follows is a story of how the children acclimatise to life aboard ship and an entirely male crew, and what they have to do to survive. I gather this was first published in 1929 and I would imagine it caused quite a stir. 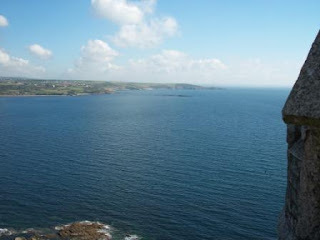 The story is told from the point of view of Emily, a ten year old Bas-Thornton. There is an older girl from another family with them, Margaret, who seems to be around thirteen to fourteen, and what happens to her is broadly hinted at but left to the imagination. This is no fairytale of *nice* children and their adventures. There is death and murder and Hughes' depiction of children is more akin to Golding's Lord of the Flies than to what I would call a normal view where children try to do the right thing. Here they are not completely self-aware and tend to do what they have to in order to survive. And some of that is quite chilling to read about, and told rather matter-of-factly, which makes it even more shocking. It's definitely a disturbing book but also very humorous in many places; you could call it a black comedy of errors. I liked it but had no idea what to make of it once I'd finished and am still, two days later, thinking about the implications of Hughes' story. But then... that's what good literature does, doesn't it? It makes you think and ponder and, ultimately, changes you somehow. 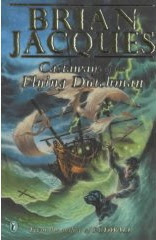 I'm still in the middle of two books, Sherlock Holmes, and High Wind in Jamaica by Richard Hughes for my seafaring challenge, so no new reviews. Instead I thought I would copy Tara's post and do a sort of a wishlist for 2008. Books I have on my tbr pile and would like to read next year kind of thing. 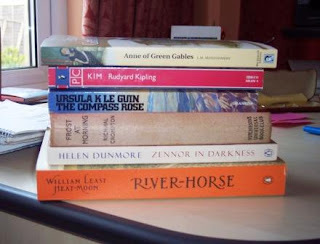 And I think such a post needs a few illustrations so I'll start with a photo of *part* of my tbr pile. (It probably consists of several hundred books altogether.) To tell the truth it's spread all around the house but these in my study are the main batch. Anyway, for starters these are some of the books I would like to read during 2008. I think that's 20 books altogether. And I'm not expecting to read them all as I'll have two challenges on the go as well, the Cardathon one and What's in a Name? Plus, I am terribly moody when it comes to choosing my next book to read. But just to knock a few off the pile would be excellent. Another pic. These are the top shelves, well part of them anyway. I'm kind of wondering if I might have bitten off more than I can chew but this is an informal thing, apart from the official challenges I'm doing, so really there's no pressure. 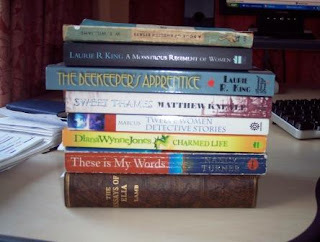 These are all charity shop, AM, or eBay buys apart from the Laurie R. King series. So, it rather looks like 2008 is going to be quite a busy reading year. 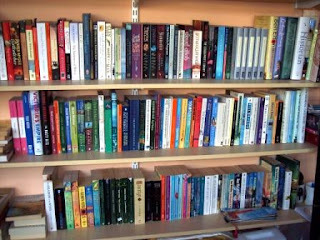 I did promise myself that I would go for quality rather quantity next year - I do tend to be quite a keen counter of books read each year. But I don't see why I can't be both relaxed about my reading *and* have some kind of plan to work to. I seem to be getting into the habit of reading several books at once. This is very unlike me! I usually read one book religiously until it's finished and then move on to the next. I'm not sure why it's changed suddenly, other than I decided I needed a different bedtime read to the one I was reading during the day, a book about the rise of the Nazis. I prefer something a bit more cheerful to go to sleep on! So I've been reading The Adventures of Sherlock Holmes at bedtime and that's still ongoing and very enjoyable. In the meantime I've finished the Nazi book and also read Little House in the Big Woods by Laura Ingalls Wilder. Anyway, a little about both of those. I found Defying Hitler by Sebastian Haffner in the library. (Why I need library books when I've hundreds of books of my own is one of those little mysteries which we won't go into here.) I immediately spotted it as *my* kind of book and so it proved to be. The author was born somewhere around 1907 into a rather literary, 'thinking' German family. Age-wise this places him in the thick of some the most momentous years of German history and he charts the progress of WW1 carefully; how as a child was obsessed with battles and casualties and so on. Things begin to go wrong after the war. War reparations took their toll on the economy and population, a revolution followed and a man called Hitler gradually began to emerge as a force in German politics. The insidious manner in which Hitler's party took over the country is depicted in all its horror, especially in regard to the Jews as the author, although not Jewish himself, had a Jewish girlfriend and many Jewish friends. Many opinions are expressed about the personality of the average German, his susceptibility to brain washing and the fact that Germany was at a low ebb and Hitler took his chance. You sense the author's outrage and disgust at the goings on, how suddenly he was unable to speak freely to anyone because you never knew what their stance was on the political situation. You also sense his feelings of inadequacy that he is unable to do anything to halt the onslaught of barbarity, realising that his death in a concentration camp would be a futile gesture. His gradual realisation that he will have to leave Germany is heart breaking because it's clear he loves his country, his hatred is for what has happened to it. The narrative finishes in 1934 just after his return from a Nazi camp that he has had to attend in order to be eligible to take his law exams. His son finishes the author's history, not because he dies - he lives to a ripe old age in fact - but really because Haffner stopped writing the book and shoved it away in a drawer. The son finds it after his death and thinks it worth publishing. Which it most certainly is. The slow decline of an entire country into fascism is a fascinating, if tragic, thing to read about. You wonder how it can happen and then realise from reading this book, just how easily it *can* happen. The author's opinion is that it couldn't happen in a lot of countries but I'm not so sure. Many Germans just sat back and hoped someone else would stop Hitler, they 'did nothing' in other words and we're all inclined to do that more than we like to admit. An excellent, informative read. I spent yesterday recovering from a stomach bug so a gentle read was called for. I've been intending to read Laura Ingalls Wilder's 'Little House' books for a while. I never read them as a child but my daughters were huge fans, so much so the books they have are falling to pieces so I bought a new edition of Little House in the Big Woods. I'm sure most people have read these and already know that this first book is all about Ma and Pa, Laura and Mary, and little baby Carrie who live in the forests of Wisconsin in the late (I think) 1800s. It charts a year of living, from winter right around to autumn, trials and tribulations - but also many good times. I found this utterly charming and actually quite informative as to the way families lived and survived. Family was clearly hugely important, you relied entirely on your immediate relatives for your survival and more distant ones for things such as bringing in crops and entertainment. Human nature is here too. Laura is jealous of Mary because Mary is fair haired and pretty and people praise her and ignore Laura who has brown hair and feels herself not so pretty. Cousin Charley is spoilt in Pa's opinion because he's not made to help on the farm enough. The day they force him the boy makes a complete nuisance of himself on purpose. A delightful read which I'll be passing on to my grand-daughter as I know she'll love it. And I'll be reading the next one, Little House on the Prairie, soon. At last I have a computer of my own again after losing mine and having to use my husband's for two months. (He never complained once!) Anyhow, that means I now have access to my photo programme again, despite having lost many precious photos in the crash. (It's been a lesson to me, believe me.) 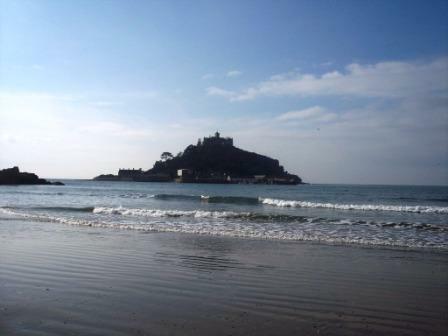 So, I thought I'd post some photos I took of St. Michael's Mount while we were in Cornwall, on holiday, in October. They're not very seasonal because, as you can see, the weather was glorious! 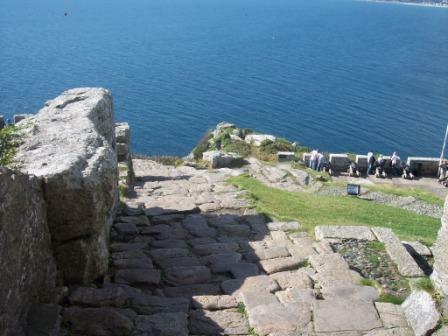 It was quite a climb to the top and there are warnings at the bottom against attempting it if you have health problems. We were borderline (Hubby has a heart condition) but we risked it and were glad we did. 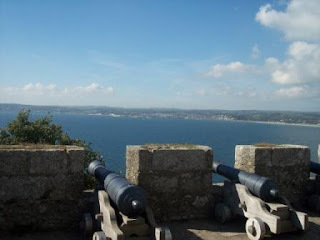 I was a teenager when I last climbed to the top of The Mount so the views took my breath away as though new to me. I haven't put any family photos up as I'm a little wary of it but anyone wishing to see a family one drop me an e.mail (I think my address is on my user info) and I'll pop it along. I've been trying to decide on book challenges for next year. I want to strike a balance between taking on the ones I fancy and overloading myself to the point where I have to read something from a challenge rather than what I feel like reading. 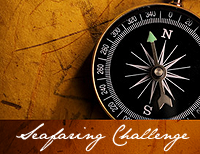 At the moment I'm in the middle of one, The Seafaring Challenge, which finishes at the end of January. For that I have just two titles left to read. I also plan to do The Cardathon one, but haven't sorted out the books for that yet and may well stick purely to novels written by Orson Scott Card. Actually, that really appeals as I feel sure I will like his writing. I'll probably read six for that one and it lasts all year, so that's fine. I've decided on one other that lasts all year and then when a shorter one crops up that I fancy I'll feel free to have fun with that without feeling too pressured. The trouble is I'm a creature of moods where reading is concerned and sometimes I just want to read what I fancy rather than what I have to read. Anyway, the other year-long challenge I've chosen is the 'What's in a Name?' challenge, hosted by Words by Annie. I just loved the idea of choosing titles to go with certain words and had a lot of fun picking the books from my tbr pile. Here's the link for this challenge: What's in a Name? As I said, I had fun choosing the titles but in some cases didn't find it very easy. 'Animal', 'first name' and 'weather' were obvious to me as those are three books I wanted to read next year anyway. But the other three I agonised over. I plumped in the end for Anne of Green Gables for the 'colour' as that's a set of books I fancied rereading next year (I don't think I've actually read all of them). 'Plant' gave me loads of problems and I'm still not sure about my choice. I may change that eventually - even though I love Ursula Le Guin, I'm not certain about this particular book. All of these books I own apart from one, which is Anne of Green Gables, and I'll be adding that to my Christmas Amazon order. To the Lighthouse by Virginia Woolf has been on my tbr mountain for a couple of years now. I decided to read it for the Books to Movies challenge, a challenge which sadly I have a feeling I'm not going to be able to complete. (RL turned busy and difficult just after I signed up for it in August.) But I did, nevertheless, want to read this particular book as I've long wanted to find out whether I'm a fan of Woolf's writing - or not. So, am I a fan? To tell the truth - decisive as always - I'm not sure. I started this book and got to about page 70. I struggled all the way with her rambling style, her going off at a tangent about this, that and the other. I don't know why it irritated me, I usually have a lot of patience with that style of writing, maybe I wasn't concentrating hard enough, I don't know. Sometimes she just totally lost me! So, I gave it a rest for about a fortnight. Read a couple of other things and then went back to it. The story, btw, is about the Ramsay family who own a holiday home on Skye. Really it's about the family and their hangers-on, the dynamics of the relationships between them and especially what kind of marriage Mr and Mrs Ramsay have. So, anyway, after a fortnight or so I went back to the book. And somehow it didn't seem as bad. Suddenly I didn't feel like flinging it across the room but was reading it quite happily. Did she stop rambling after seventy pages? Was I in a different mood? I haven't a clue. Nor can I decide whether I actually liked it or not. I couldn't help comparing it to a wonderful Persephone book I read in the summer called Family Roundabout by Richmal Crompton. That too was a book about families set around about the same time, if memory serves me correctly. I'm very much afraid the Woolf book came up wanting. Family Roundabout was so much more involving, crisply written, amusing - I was desperate to know what happened to all the members of the family. Sadly, in To the Lighthouse I wasn't really all that bothered. Does this make me a Philistine? The fact that I prefer Richmal Crompton's writing to that of the genius that is Virginia Woolf? I'll have to think on that one. Maybe try one or two more of Woolf's books or essays before I cast judgement on my own judgement (so to speak). The thing is, I really want to like her writing. I feel as though I should like it for some bizarre reason. After all, I saw and enjoyed the movie of Mrs Dalloway and yes, I know a film is a very different kettle of fish to a book, but nevertheless I found the story interesting and liked what it had to say. I honestly don't know what to think (no change there then) and clearly will have to try another of her books in order to form some kind of definite opinion. 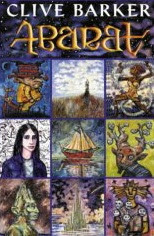 Currently reading: Abarat by Clive Barker. 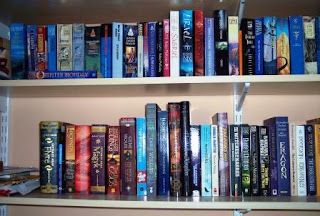 I've been trying to get around to listing my books for The Seafaring challenge, hosted by I Heart Paperbacks, for weeks. I haven't added links as I don't have time at the moment but will do so later. Smoke and Mirrors by Neil Gaiman is the fourth book of my RIP II challenge for this year. Anyway - Smoke and Mirrors. A good antholgy. I didn't like all of the stories but then when do you ever? I think, like a lot of people, I would say the best story is 'Chivalry', a story I read for one of the Short Story Sundays and reviewed a few weeks back. But there is plenty more to enjoy. I liked 'The Price' very much indeed - a story of a cat taken in as a stray but who is getting into terrible fights during the night. Its owner keeps him in for four nights to recover and finds the family have terrible luck during those four days and nights... 'Troll Bridge' was also very good. It tells what happens when a boy goes for a very long walk along an abandoned railway track and eventually comes to a bridge. He makes a bargain there that he will revisit many times during his life. Atmospheric and intriguing that one. 'One Life Furnished in Early Moorcock' I liked a lot too. Unless I'm mistaken this isn't really a sci fi story at all but I liked it all the same. It's just a story about a boy's school days and his love of Michael Moorcock's 'Elric' fantasy stories. It was delightful and slightly autobiographical I gather. Other stories of note, Looking For the Girl, When We Went to see the End of the World By Dawnie (charmingly written as a child would write), We Can Get Them For You Wholesale and Snow, Glass, Apples (for those who think they know the story of Snow White and The Seven Dwarves;-)). In fact, there were only a few in the whole book that I didn't care for. This book has reminded me of how much I like short story anthologies. I used to read them a *lot* but hardly any these days, and that's a shame so will try to put that right. The only word of warning I would add is that I know there are folks out there who don't care for a lot of sexual content and a couple of the stories are quite explicit, or are of the sort where the author calls a 'spade a spade' if you get my drift. But if that's okay with you then you should enjoy this anthology. As I've now read four books for Peril the First, I suppose I've officially finished the RIP II challenge. I've done a couple of Short Story Sundays (hope to do another next Sunday) but probably won't have time now to read the extra book, which in my case was The Mystery of the Sea by Bram Stoker. I still plan to read it though and probably the rest of the pool as they're all books I want to read. I'm currently reading The New Lovecraft Circle edited by Robert M. Price and am enjoying that a lot. Hoping to review a couple of the stories for Short Story Sunday if I have the time. I've now finished the third of my RIP II challenge books, the YA adult book, The Haunting of Alaizabel Cray, by Chris Wooding. Compared to some of my other latest reads this was a very easy read indeed. Not simple... I don't mean that... just incredibly readable, 'a page turner' as they say. The story is set in London but not a London that we know. It's Dickensian in nature but there are some nasty things coming out of the woodwork at night, the wych-kin, literally the stuff of nightmares. Thaniel Fox is a wych-hunter, a good one. He's tracking down a cradlejack one night when a terrified girl, Alaizabel Cray, literally runs into his arms. She has no idea who she is or where she's come from but it's clear she's been abused by someone and is being haunted. 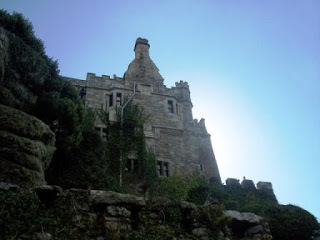 Gradually the story emerges, she has some connection with The Fraternity, an evil, secret society made up of some of the well-to-do and most powerful people in the city. So what's going on? Whatever it is it seems it might spell the end of London as a city and life as they know it, and Alaizabel is the key to unlocking the mystery and saving them all. As I said before, this is a page turner. A rollicking good yarn which is nice and spooky, pacey, and well told. It's YA so nothing too horrible (thank goodness) and I seemed to detect a slight touch of Cthulu Mythos about the tale too. The Dickensian aspect of the city was more than a little attractive to me - I love a good 'seedy, 1800's London' yarn and here it was well done with even a crime element included with a serial killer at large. So this is a real mix... historical/horror/crime etc. And it works! I loved it and will read more of Chris Wooding's work if I can find it. In fact he has a new book out on the 18th. of this month, The Fade, which sounds like it might be really good. At last, a free morning to catch up on reviews. I'm behind for a variety of reasons but hopefully when I've done these two I'll be able to keep up better. The Historian has been such a popular book for this challenge and so many people have written excellent reviews that I feel like I haven't a lot to add to what they've already said. Most people seem to have loved it and I'm no exception. The story concerns a young woman - I'm not sure we ever learn her name - who comes across a book in her father's library. It's empty apart from an illustration of a dragon in the centre. Disturbed by the drawing the girl questions her father, who is upset to learn that she has found the book... or rather that the book has found her. Over weeks and months she gradually draws a very long story out of him, despite his obvious reluctance. The story concerns the disappeareance of the father's tutor, Rossi, when the father was a student and how he went searching for him across Europe. And thus how he met the girl's mother and how the quest tied in with the history of Count Dracula. This is not a quick read. It's a story to be read slowly and savoured, not least because several histories run parallel to each other and you need to keep your wits about you while reading it. I think for me one of the best qualities of the book is that it doesn't treat its reader like an idiot. It's unashamedly about a book about people who love books and who are very well educated, and I like that a lot. I'm not clever enough to be part of such a world... but oh, how I would love to be! Another plus for me was all the wonderful travelling depicted. I'm such an armchair traveller and lover of travel books that all the too-ing and fro-ing around Europe was definitely part of the book's attraction, imo. And it was nicely creepy - not all the way through, but enough to make it something other than a travel and history narrative, and book about books. One other curious fact for me is that the BBC are currently showing Michael Palin's new travel show and where should he be exploring but Eastern Europe where much of The Historian is set of course. I call that an odd coincidence. And it's making me enjoy the series even more than I would normally. A Time of Gifts by Patrick Leigh Fermor has been sitting on my tbr mountain for a couple of years. I believe it and its sequel, Between the Woods and the Water, are classics among travel books and I can easily see why. The reason I picked this one up now was because of The Historian... I just wanted to read some more European travel stories and this one fitted the bill nicely. 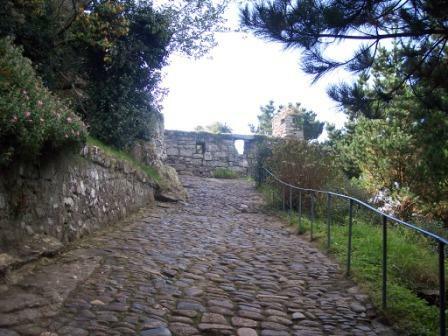 The book is actually about the author's walk from Amsterdam to Constantinople in 1933. He is only 18 and not well off so he stays in cheap places or with friends he makes along the way. This first book takes him through Holland, Belgium, Germany, Austria, Czechoslovakia and into Hungary. Germany at this time was just entering its Nazi period and the author had one or two experiences of that but not as much as you would have thought. Basically, he found nearly everyone to be very kind regardless of nationality - their's and his. But Europe was changing and it was very odd reading about a way of life that would only continue for a few more years until the start of The War. This is another book which assumes a certain amount of intelligence on behalf of its reader. The language was something else. Nearly every page had a couple of words I'd never heard of, but then I was expecting this as I'd heard about it on LibraryThing. The writing itself was beautifully descriptive especially when dealing with the winter landscapes the author travels through. 'Possibly' I would have liked more in the way of human stories instead of so many descriptions of architecture but that's a small quibble. I enjoyed the read and will certainly read its sequel very soon. I want to thank all the kind people who commented on the sad loss of my sister-in-law recently. Everyone is so kind, even though I've hardly been on Blogspot any time at all. 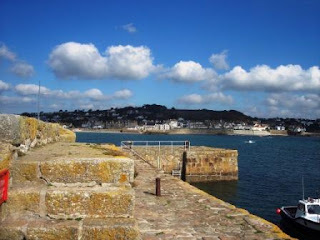 The funeral went very well and the next day we scattered her ashes off The Cobb at Lyme Regis... a spot made famous by Meryl Streep in The French Lieutenant's Woman of course, and a place my sister-in-law loved very much. A review of The Historian and A Time of Gifts will be forthcoming tomorrow hopefully. Time allowing. I'm now reading the third of my RIP II books, The Haunting of Alaizabel Cray by Chris Wooding, and loving it. I'm pretty certain of completing the challenge but not sure if I'll have time for the extra book by Bram Stoker. We'll see. It's been so busy and will continue to be (though not quite so bad) until the end of the month.